The communist witch hunt of the House Un-American Activities Committee, and the resulting blacklisting of several Hollywood talents, is one of the darkest episodes of the studio age. It destroyed careers, friendships and families, and created an atmosphere of fear and mistrust. 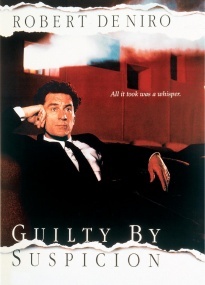 Guilty by Suspicion, recently re-released on DVD by Warner Archive, attempts to capture the tone of the times, and occasionally it does, though the results can be uneven. Robert De Niro stars as David Merrill, a Hollywood director based on real life blacklist victim John Berry. He is liberal, and all but apolitical, but when his friend Larry Nolan (Chris Cooper) names him as a Communist sympathizer while testifying before the committee, he is suddenly the focus of HUAC himself. His offense: attending a few meetings out of curiosity in his youth. Merrill resists testifying, knowing that he will also be asked to name names. His independent-minded ex-wife Ruth (Annette Bening) stands by him, while everyone else he knows falls away, fearful of scandal. Finally giving in to the pressure, he testifies, only to find that he cannot influence the committee as he had hoped. Guilty By Suspicion is a glossy, expertly-conceived Hollywood product. It looks good, the actors are slick and it glides through its story with a fair amount of ease. Something about it rubs me the wrong way though. It felt so calculated, so performed rather than felt. I could see the gears turning in the actors' heads. 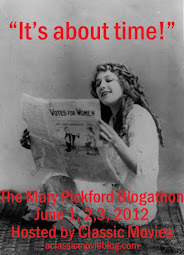 I wondered if a lower budget and a little added grit could have given it more authenticity. Part of my irritation was with De Niro, who would drag out a version of his "you talkin' to me?" Taxi Driver speech every time he got angry. He'd repeat himself with the same cadence and in the same tone. It was distracting. I kept seeing De Niro, not Hollywood director David Merrill. In an interesting contrast, Martin Scorsese steals his few scenes as director Joe Lesser (based on Joseph Losey), who chooses European exile over testifying. I'm glad that Scorsese focused his career on directing, but can't help wishing he'd devote a little more energy to acting. He's always an exciting presence on the screen, charismatic, natural and full of the verve you'd find in a classic Hollywood character actor. Overall, I felt like most of the film could have been about most any kind of scandal affecting an individual. It was almost too personal, focusing so much attention on Merrill that the larger picture suffered. I don't know how much meaning it would have had for me if I didn't already know so much of the real story. It is only in the last scene, where Merrill testifies, that I fully felt the frustration and fear imposed by HUAC. The bullying tactics of the committee, and the director's futile attempts to reason with them, or even to be heard, get your blood boiling. You can see how rotten the whole process is and how nothing good could come of it. If only the rest of the film felt this intense and painfully real.